During the period 1st - 17th March, LA Helicopter's Chief Pilot Guillaume Maillet and Assistant Chief Instructor Giles Haybittle provided a bespoke training course in the Republic of Rwanda. 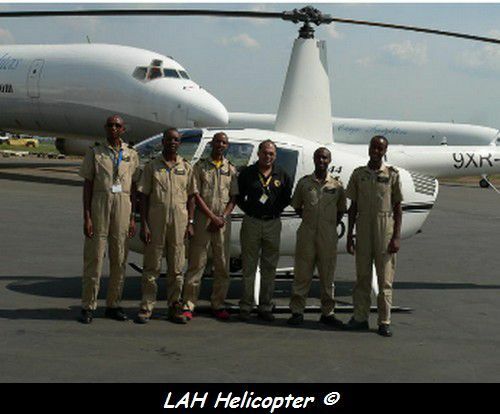 A long time business customer of Los Angeles Helicopters, Akagera Aviation is a full service helicopter operator, with services ranging from sightseeing and training through to aircraft sales and maintenance. The LA Helicopters training was a customized Advanced Mountain flight course in the Robinson R44 that will ensure safety of operations in Rwanda's rugged and remote landscape for Akagera's growing operation. Los Angeles Helicopters operates from their purpose designed facility at Long Beach airport (KLGB) with a large ramp area and an ample amount of helicopter pads. Their administration offices and training center are co-located with their hangar facilities. Los Angeles Helicopters classrooms are well appointed with the latest computers and projection, allowing video and slideshow presentations. With a maintenance facility on site, students also have access to aircraft parts and to view aircraft undergoing repair which is very advantageous when learning about aircraft systems and gaining a better understanding of helicopters. For more information, visit www.lahelicopters.com.